Here we are again with our Dev Diary series. This time we want to let you know about the upcoming changes in internal communication tools in Oxwall. Messaging communication keeps getting transformed. There’s a reason why the border between email and instant messaging blurred so much, and we are not fully content with any one of these. People don’t necessarily want to remember where the talk happened. It’s just convenient to have everything in one place with ability to search. Sometimes it’s really much more convenient to keep your chat going in a focused, standard page interface, than to type and read in that small chat window; or to have back-and-forth email followup’s in bite-sized messages. Fundamentally, while a social website is a complex system, sending a message is a trivial, casual, frequent operation. It means, there have to be different ways to send, receive, and respond to messages, all suitable for context and task at hand. But then, communication is different. While casual messaging is sufficient for some websites, other may really benefit from a more formal, email-style approach. Since Oxwall websites are used for different purposes, we have to support both paradigms and make them work nicely together, if required. – Provide granular (if excessive) permission settings for every action in mailbox and chat. The new Messages plugin will be available as the successor of the two current plugins with the platform 1.6.1 release. We hope communication in Oxwall will become much more efficient now. And of course, we are ready to iterate on your feedback. Thank you for being such a fantastic community! This entry was posted in Dev Diary and tagged Dev Diary, Oxwall Foundation by alina. Bookmark the permalink. This is great news, one question. Will this work with the Video Chat plugin in the store at the moment, or will the developer need to update their plugin first? If their plugin relies on the current Instant Messenger plugin, they’ll definitely need to update it for compatibility. Ho ! A new post ! Not the one i was waiting for… but good news ! Fantastic! Can’t wait to see it in action — what is our media limitations, if any, that can we attach to each message? File types and size are defined in general settings, in administration area. The plugin itself will only enable/disable the attachment feature. When it will be available in the Store? Together with the release of Oxwall 1.6.1.
will this chat finally be instant? or will it still take 3-5 seconds to send a message? This isn’t supposed to be that way. I’ve checked your site and it’s really slow. You should probably evaluate your hosting resources. and we said it should be this way long ago you just now do it and take credit for the idea? I love Oxwall. It’s really great! Will the new Messaging allow group chats? you say you checked my site this has always been like that on all servers even other peoples sites I check it takes several seconds for the server to ping and how would you check this on my site since i am currently not using Instant chat? I just meant your site feels slow in general. Chat obviously depends on the overall performance. I can’t wait to get this update! We really appreciate all you are doing for us! Right now we are in the process of internal testing. Public beta testing and general availability date will be announced later. @Joel: can you log in to your admin area at all? Go to Global Privacy and make sure mandatory is not checked, and then make sure guests can view your site. I am no expert or anything, tho. @alina so the new chat is like facebook/gtalk messages/chat? Pretty cool. Will this release have any new themes? No, this release will not contain any new themes, but you can find them being added by third party designers in the store. I would suggest some sort of choke feature to prevent new users from private message spamming all of the other users. Some sort of limit or a limit based on time and number of public posts. I love Oxwall ! It has really made my website come to life ! I have bought many of the plugins and look daily for new ones that will enhance the website to be the best it can be. Are there any plans for a standalone messenger ONLY for the Oxwall website ? I think this would be a phenominal feature ! IflyChat.com is a plugin used for buddypress. 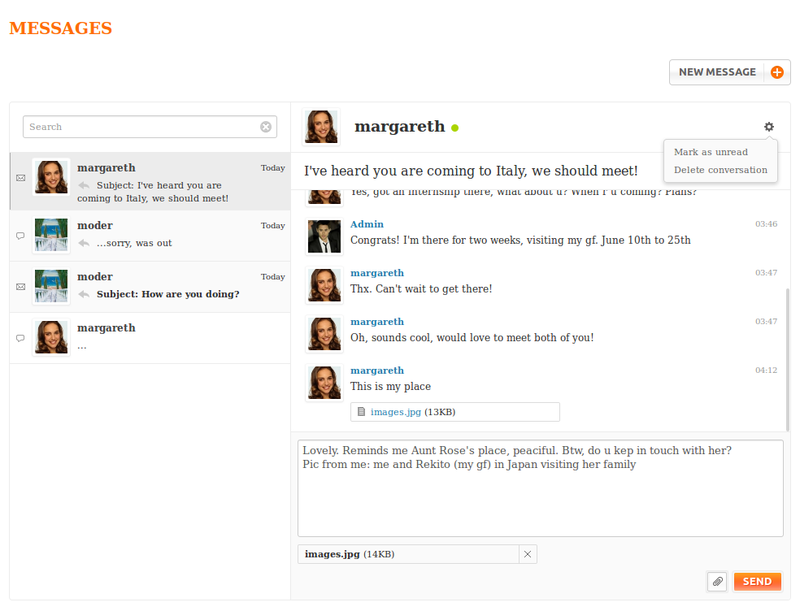 It allows free and paid versions, its like facebook chat/arrowchat. That may be a good plugin for oxwall too as it allows group chats and private as well. This might be a nice idea for somebody in the community to pick up and develop/integrate. We don’t plan extended messaging features at this point. @Emil: would be a nice idea, to have some kind of chat import. However, will the new cat feature be mandatory? Will it take place of the ajax chat in a mandatory way or will you still be able to use the old mailbox and the old plugin as an option? We’ll offer a way to migrate old data to the new plugin. You can still choose to use the old plugins but they won’t be supported any more.